I don't have the small motor dexterity to construct and decorate gingerbread houses, even with those pre-cut kits. The baking of gingerbread doesn't faze me, but I am no good at icing and decorating. But I was so excited about the gingerbread cake dessert I whipped up for Christmas dinner. My old college roommate gave me a sandcastle-shaped Bundt cake last summer - why? I don't know. She lives in Rome, Italy and is a contemporary art curator and historian, so there may have been some coded ironic message about American consumerism. If she reads this, she can tell me. But as Freud might have said in the aisles of Williams-Sonoma: "sometimes a Bundt pan is just a Bundt pan." So I have this sandcastle bundt cake pan which may or may not be a covert witticism but it's also a very cool-looking form. Last week I tested out a gingerbread (cake) recipe in it (see version 1.0 above). The white bits are where I was clumsy with the PAM spray and "light flour". Cooking spray is new for me, but I thought it was necessary to get into all the little crevices of the bundt mold. I was more careful in version 2.0, but this time I hadn't cleaned out every tiny crumb from the crevices so the turret detail was not optimal. Dang! I scoured it using various contraptions, soaking, etc. but I shall have to buy a bottle brush. Then I made a compote, adapting a recipe out of a Russian cookbook - dried appples, apricots and raisins, a little sugar, a cinnamon stick, ginger and a few cloves, lemon zest, and at the very end a splash of rum. I really wanted to use orange flower water but my husband voted for rum. 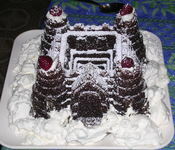 For Christmas dessert spread whipped cream around the castle base and daubed a little on the turrets; David sifted confectioners sugar over the bare parts. Mother-in-law Celeste had fresh raspberries out for the kids so I swiped four for the turrets. I imagined that the apricots would look like gold treasure or something. Having grown up around Middle Eastern Crusaders' castles, I find this whole construction wildly romantic, and love the Arab influences of the compote. I was going to stir in pine nuts as well - I once ate an apple compote in Arcos de la Frontera, Spain, made from an old convent recipe, with walnuts and orange flower water. But I forgot, and my in-laws, who have really good taste in these matters, said it was just as well. Pine nuts are even more Moorish/Arab than the walnuts would be. But the rum is pure Crusader influence! Some other time, if this is a success, I'll do it again with orange flower water, to be incredibly Andalusian/Moorish/Arab about it. Ginger and most of the spices used in gingerbread (I added cinnamon, cloves and nutmeg to the recipe) were introduced to Europe by the Arabs, via the Crusades. Apricots and dried fruit compote are beloved by the Arabs, as well. So I'm tickled to make such a Christmas-y dessert that pays homage to the half of my family that's Middle Eastern. I thought of naming the cake Krak Des Chevaliers after a castle in Syria I've never visited. I just like the name. Rome. Jesus visited my hometown (Sidon and surrounding hills) and the Apostle Paul founded early churches in the area. When the Crusaders came to "liberate" Palestine and Jerusalem, they found indigenous Christians who traced their spiritual lineage back to the apostles and Jesus himself. So a Middle Eastern castle Christmas cake is a perfectly appropriate reflection of my cultural and spiritual heritage. Philip K. Hitti was a Princeton professor of history who wrote a long History of the Arabs. You may want to read the updated The Arabs: A Short History. I've really enjoyed reading The Arab Americans: a History by Gregory Orfalea. On the literature side, you'll want to look for his anthology Grape Leaves: A Century of Arab-American Poetry. A revelation. Arab-American literary activity in the 1920s was vibrant and diverse. Who knew? A book list on the Israeli/Palestinian conflict, developed by Arab and Jewish scholars for a lecture series sponsored by Jewish Voice for Peace. Marc Lynch's upcoming book on Arab Media is probably going to cover lots of ground you hadn't known about: satellite TV, talk shows, radio, etc. More on the literary side: Peruse the Amazon list of strong Arab women writers (compiled by Rania Masri). I've read (or plan to read) many items on the list. I've enjoyed at least one novel by the Franco-Lebanese writer Amin Maalouf: Leo Africanus - and I plan to track down The Crusades Through Arab Eyes and read that one of these days. It's important for Westerners to view through a different lens. Maalouf is an Arab but not a Muslim, by the way. Since he writes in French, he is not widely known here in the USA but his novels are informative and entertaining and deserve an audience here. Tariq Ali, the British/Pakistani historian and writer, has published a multi-volume set of novels about the history of Islam. I bought the first two but lent them out to my mother before reading. She loves them. I believe she's got Shadows of the Pomegranate Tree (about the aftermath of the fall of Granada) and Saladin. I sent A Sultan in Palermo to my father-in-law for Christmas. Reading fiction helps you get an emotional feeling for the culture as well as history. And while Islam and the Arabs are not one and the same, you must understand this early Islamic history to "get" anything about the Arab world today. Even those of us from Christian Arab backgrounds feel connected to this history. I strongly recommend the anthology of short stories titled Dinarzad's Children - short fiction by Arab-American writers. Look for a new anthology this spring from Interlink Books, edited by Nathalie Handal (who is a powerhouse of contemporary Arab letters) - it collects Anglophone Arab writers - don't know the title. A short piece of mine will be in it. And if you listen to Barbara Nimri Aziz on WBAI New York, stay tuned for an interview with me in which I read the piece. (She also interviewed my father, a poet). You'll notice that I don't recommend anything by Bernard Lewis. I read him in college; however today many Arab and other scholars consider his viewpoint to be condescending and skewed. I'm not a specialist and it has been 25 years or so since *I* read him so I don't want to opine. You may find him interesting - just read him with this controversy in mind. If you read comments on Arab-American scholars like Albert Hourani and Philip Hitti posted in Amazon.com, you'll find these guys also spark hatred from some folks. Even the most respected of scholars get accused of bias from people who are fervently attached to their own points of view. Lewis himself is pained by the suggestion that he is anti-Arab or colonialist, etc. etc. These are some of my suggestions. I am sure many readers will have comments or criticisms, but please, only constructive remarks. I'll delete nasty messages! This blog is like my living room, it's not a newspaper, a courtroom, or a political talk show. Welcome, and be kind. Update: The ever-perceptive Alison asks why no Naguib Mahfouz? I listed mostly historical fiction from the deep past of the Arabs, didn't think of Mahfouz because he's so associated with early 20th century Cairo. But he's the most well known contemporary Arab author, and he's considered the Balzac of the Arab world. Therefore, please do read the Cairo trilogy. I have also read The Thief and the Dogs, and Miramar. The topic of contemporary Arab literature is so vast that I don't feel qualified to give you a good "best of" list. However I'm an MFA grad student so I'll research it and get back to you. If you're interested in a history/life portrait of Cairo, read Max Rodenbeck. Name-dropping moment - I'm researching my Cairo diaries circa 1983 for a short story, and find that Max took me to the Liberty cafe at least twice - in search of Naguib Mahfouz, because he famously hung out there in those days. We were both barely 21 years old. I am sure Max met him eventually but I never did. Maria Golia's book on Cairo (see Amazon list at left) is more for the enthusiast, someone who is already familiar with the place. She gets into the many layers of the city, its language, its culture. I enjoyed it but it might be tough going for non-Arabic speakers or those who have never been to Egypt. Further Update: People find this blog by searching on "Lebanon Reading"; however, as previously posted, they were missing this entry. If you want to understand Lebanon, you must also understand the history of the Arabs. Some patriotic, xenophobic Lebanese like to think of themselves as "not-Arabs" and somehow outside of the history of the Arabs. This view is silly and possibly harmful. If you only read the history of Lebanon and have no clue about the larger stories around that small country, you will become confused and make many ridiculous mistakes. If you are a policy maker in power you might make fatal mistakes. See Ariel Sharon and Ronald Reagan in 1982. Rami Khouri, editor of the English Language newspaper Beirut Daily Star, discusses Facts and fantasies about Arab satellite TV. In the past three years, covering the Anglo-American led war in Iraq and its messy aftermath, I've made it a point to regularly watch Arab, European and American television services in order to compare their coverage. On the basis of what I have witnessed during the past 1,000 days, I would like to bet Donald Rumsfeld a double cheeseburger with cheese, and Karen Hughes two tickets to a Yankees-Rangers baseball game on a balmy July evening, that the overall coverage of Iraq on the mainstream Arab satellite services has been more comprehensive, balanced and accurate than the coverage of any mainstream American cable or broadcast television service. He's mostly talking about Al-Jazeera here, but he includes other services. Good for him. You should read the whole article if you want to know more. Thanks to Abu-Aardvark for picking this up. My wonderful government - Homeland Security makes me feel so secure! The brilliant young writer and Mills College professor Yiyun Li has been denied a green card: Will Words Fail Her?. We've been hearing about this at Mills all semester but were told that she prefers not to make a public fuss for now. Perhaps the time has come in her view to make her case known. It's ridiculous. I hope the Frank O'Connor prize ($50,000 Euros for best short story writing) will help her case. They say she's not at the top of her field somehow. Juan Cole says it all. Warning, not the usual Dovish positive spin: Bush Spying on Americans. It was a good run, this United States of America with its Constitution and its Bill of Rights. How sad that a gang of unscrupulous criminals has been allowed to subvert its basic values altogether. Is there even a single one of the guarantees in the Bill of Rights that Bush and his henchmen have not by now abrogated by royal fiat? And why? Because of a single attack by a few hijackers from a small terrorist organization? The thousands lost in the Revolutionary War did not deter the Founding Fathers from enshrining these rights in the Constitution! The fledgling American Republic was far more unstable and facing far more dangers when this document was passed into law than the unchallengeable hyperpower that now bestrides the globe as a behemoth. The list of Lebanon links has returned to the right-hand column, for your information. Tony Badran has kindly translated the letter written by Adonis, the Syrian poet, to the father of the slain journalist Gibran Tueni. First printed in Arabic in An-Nahar, Beirut. You know better than all of us, you the wise experienced one, that fatherhood in such a moment, as it bows under the weight of the tragedy, must also explode like springs from the earth. I know you are the person most deeply worried about what's being imposed on us in Lebanon: to live only with ghosts. Ghosts of destruction and murder. Not the destruction of matter alone, or the body alone, but also the destruction of the spirit and the mind and the intellect. Life -- soaked in a moving carcass, and the human being -- poured into a temple of terror: that is the Lebanon that they want for us today. They want us to be cornered into a spot where it would seem as if death -- by murder -- is the only thing we see before us. It's as if it's imposed on us all to declare fear and succumb to it. In your remarkable experience, in your epic life, dear friend, we find what teaches us to overcome the fearsome and the tragic, and what pushes us to open our bosoms to the truth, and to our right to it, which is our right to life. In them also we find what tells us: if we must die -- murdered -- then let us die standing on the peak of light. Gebran Tueni is dead. News photos show young men bearing his coffin to St. Georges Hospital in Beirut, at his request. He had told his family that if he ever died, he wanted his remains brought to St. Georges as an homage to his Orthodox community. The hospital is 125 years old, and was established by Orthodox Christians to serve the poor and the sick of Beirut, regardless of religion. That Tueni wanted to be taken to St. George hospital, in the heart of the city he loved, reminds us of the greater ideals here that must not die with him. The ideals are those of caring for the least among us, caring for our neighbors whatever their religion, and of fighting evil - whether with sword or pen. Saint George Hospital's...purpose is to give hope to the sick, needy and underprivileged. To be a place to turn to in times of hardship, pain and suffering. Allowing no discrimination on the basis of religion, race or gender. I was raised a secular humanist, but I spent crucial, formative years in the bosom of my Melkite Orthodox family in South Lebanon. St. George was the patron of our village - his picture hung in every house. Renowned for his defense of all in need, St George is called "the Quick to Hear" in the Middle East by both Christians and non-Christians. An archetype of the victory of good over evil. Saint of: leprosy, skin diseases, syphilis, agricultural workers, Boy Scouts, equestrians, field workers, Canada, England, Germany, Greece, Lithuiania, Palestine, Portugual. 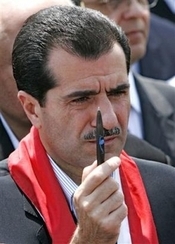 The image of Gebran Tueni holding his pen in silence, in protest, in mourning at the death of Samir Qassir, a fellow journalist, reminds me of the archetype of dragon-slayer. I understand from various sources that Tueni was not a saint; perhaps if I read every word he published I would not agree with everything. But I am moved by his determination to slay dragons. He wielded the pen as if it were a sword. I take comfort and strength in this image from my ancestral archetypes of the fighter who protects the downtrodden, the workers of the field, the lepers of the earth. As a woman and a mother I will never carry arms. But I can battle with my pen (a laptop, but we're talking metaphors and archetypes here). The assault on Gebran Tueni, Samir Qassir, Tarek Ayoub and all the other journalists killed in this terrible decade just makes me more determined to keep writing, to keep speaking out. May St. George help us fight the good fight. Let me say one more thing. Last year when I was newly diagnosed with breast cancer, I stopped in a deli in San Francisco across from my hospital. The Palestinian owners told me of a church festival dedicated to St. George happening that weekend. I went there and received blessings and an icon from the priests. The tiny icon of St. George with his lance comforted me later as I went into surgery; I imagined St. George's sword was like the scalpel of my surgeons, who were battling the cancer in me. Thank you, St. George. Update: Of course since Tueni is a Lebanese, there are seventeen hundred conflicting opinions about him. He was or he was not a racist. He cared for the poor and downtrodden, or he only cared for the rich and famous. He was a Lebanese patriot, he was a lackey of America, France, the Saudis or Ariel Sharon. He was a leftist, a progressive, a reactionary. The Lebanese Political Journal posts generally positive assessments of Tueni, with some caveats; but read the comments for negative, alternative views. My riff on St. George and Tueni is about the ideals of a powerful archetype. St. George fought evil with a sword; Tueni held his pen aloft as his chosen weapon. 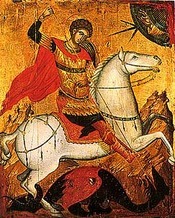 As a writer and a child of both the Byzantine East and the Free Speech West, I find the image of St. George moving. Gibran Tueni, editor and journalist, holds a pen aloft while protesting the assassination of fellow journalist Samir Qasir. Tueni was himself killed today by a car bomb in Beirut. He was the editor of An-Nahar (The Morning), which was the paper my uncles read when I was a child. I still remember the red rooster on a sunrise on the masthead. I weep for the death of any journalist, but this one really hits home. I am so sorry, and I am frightened for Lebanon. Now You See It - a novel by one of my teachers, Cornelia Nixon. It's set mostly in 1950s and 60s Berkeley, in a professorial family. The story changes points of view smoothly, the characterizations are vivid and enchanting. I love the Berkeley scenes. Am still in the middle of it so an't comment more intelligently. Cornelia also has an interview with Marilynne Robinson in this collection from McSweeney's: The Believer Book of Writers Talking to Writers. Must add that to the reading list - not only because Cornelia is in it, but because it features interviews with Ian McEwan, Jamaica Kincaid, Janet Malcolm, Tobias Wolff and others. The other book I'm actually reading this week is Mavis Gallant's Collected Stories. An early short story of hers set in Madrid has haunted me for some time, and I'm taking it apart to see how it works. At some point this week after finishing my last paper, I found myself on Amazon playing with the "shoppers who bought this book also viewed" function. Amazon required me to open a brand new account, for reasons obscure to me, so they were starting fresh. I plugged in Laila Lalami's book Hope and Other Dangerous Pursuits, and by clicking the recommendations in succession, I found many, many books I already own, including Maria Golia's Cairo book, Mohja Kahf's poems, Daniel Alarcon and Yiyun Li. These were all books I bought offline in real bookstores, so my own shopping habits weren't affecting the results. This software's guessing powers are fascinating. I usually think my interests are quirky enough that demographers and marketers can't get them right, but in this case Amazon has enough data and good enough data sifters that they managed to guess a great many of the books on my shelf - at least in its Middle East section. Another Amazon function I like (okay folks, I know Amazon's president contributes to right-wing causes, and I support buying at independent bookstores, but you have to admit, the software is fun) - the user reading lists. Some time ago I blogged about Rania Masri's Strong Arab Women Writers list - again, many of the titles on there are in my own library. Stay tuned to this space for a post of my own Arab writers reading list. Oh yeah, and for my secret Christmas present to self I'm getting Gilles Petersen at the BBC - a CD FYI.